White Material must be the type of film that passes for an action flick in France. And you know what? That's not such a bad thing. 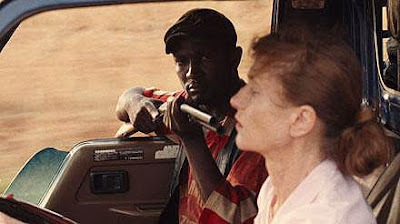 Claire Denis' political thriller takes place in an unnamed African country and stars Isabelle Huppert as Maria Vial, a Frenchwoman who manages her ex-father-in-law's coffee plantation. A parallel story follows a wounded revolutionary, known as the Boxer (Isaach De Bankolé), who hides on her plantation while the local militia searches for him. Most movies would begin by establishing the Vial plantation, its place in the larger picture, the issues raised by its existence vis-a-vis French colonialism and the exploitations of African blacks, etcetera; then show you the disintegration of the government and how it impacts the Vials; finishing with a determined Maria deciding to stay, facing an uncertain future as the country disintegrates around her. But unlike most movies, White Material actually begins at this point in the story, with the majority of the French abandoning the country, and trying to warn Maria that she is doomed if she stays. They even drop a pile of survival rations from their departing helicopters as if to hammer the point home to her. Her ex-husband, André (Christopher Lambert), is hurriedly trying to prepare to abandon the farm without her knowledge, making deals with the local mayor (William Nadylam), gathering necessities like gas in an effort to "save her from herself." Meanwhile, Maria continues as if nothing major is happening around her, recruiting new employees to replace the ones that have not only fled the plantation but are fleeing the country. She even allows the Boxer to hole up in her plantation. Huppert's Maria is not oblivious to the chaos around her. She is simply resigned to the fact that for her there is no other life. In France she would lose her edge, grow sluggish with the creature comforts so readily available to her. And where else could she, a woman, be in charge of a company? For Maria, the political upheaval is simply another challenge to be faced, one not dissimilar to the ones she has always faced as a female plantation manager in a foreign land. But just as the Boxer slowly bleeds out, the country continues its slow death march. An eerie disquiet is always creeping at the fringe of this film, a sense that Maria could turn a corner and be raped or killed by the child soldiers who search for their injured leader. And I can't remember the last time I was struck with horror the way I was here—at the frightening idea of finding oneself the target of one of these brutal children. The idea that a child—with no developed sense of self-worth or empathy—could be the one deciding whether you live or die, chilled me to the bone. Even Maria's son, Manuel (Nicolas Duvauchelle)—older yet no more mature—is eventually gripped by the madness he sees around him, and falls into a deranged mental abyss. Even after Maria and her family are buffeted by the storm of revolution, she foolishly continues to plow ahead. Therefore, think of White Material not as a tragedy, but as a cautionary tale that warns of how one can easily fall victim to the sin of pride.